This build was an especially memorable experience since it was for Pete's daughter, Emily, and her husband, Patrick! 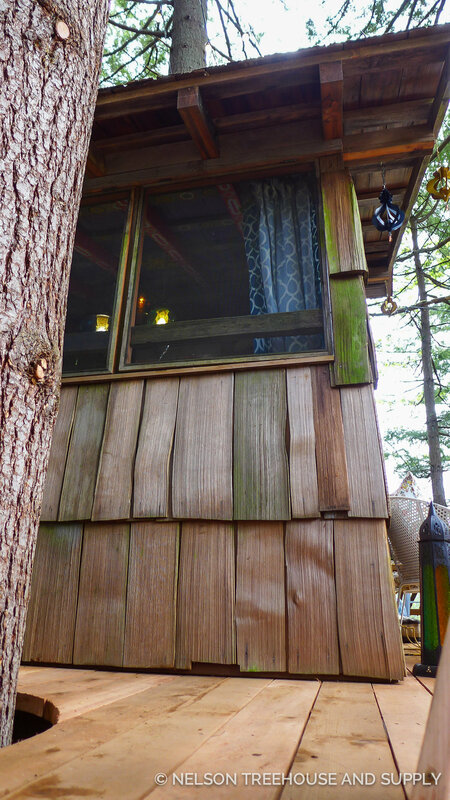 To make it even more special, Pete repurposed the much-beloved Bird Blind (a treehouse from TreeHouse Point), transporting the entire structure from its original location to Emily and Patrick's home. 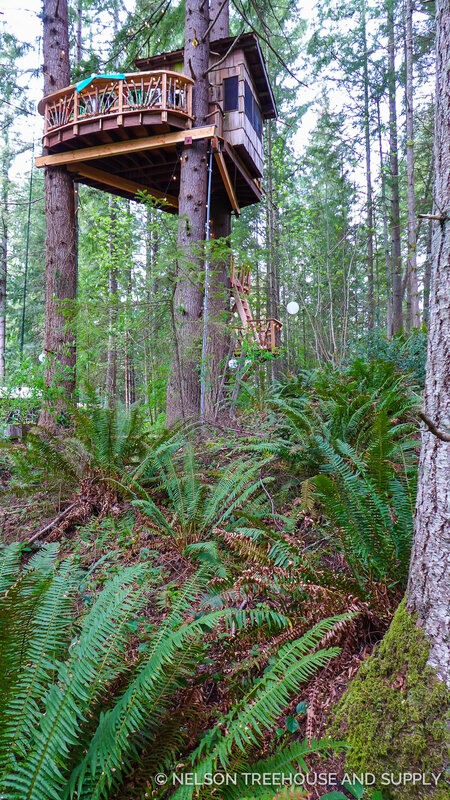 At TreeHouse Point, Pete and the crew attached the Bird Blind to a 400-foot-long high line, 60 feet from the ground. They then pulled the Bird Blind along the high line, "flying" it across the forest toward the road. 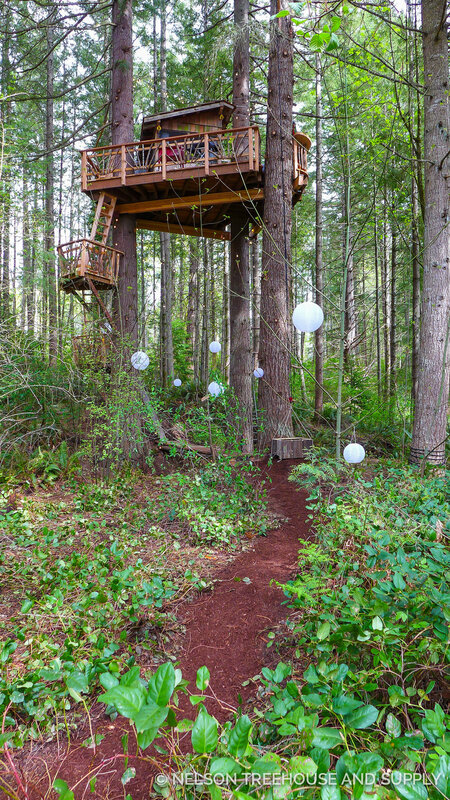 In order to prevent the Bird Blind from crashing into another treehouse's bridge en route to the road, the crew detached it from the high line and lowered it to the ground just before the bridge. The crew then sliced off the Bird Blind's roof so it would fit beneath the bridge, before loading both parts of the treehouse on a trailer for transportation to Emily and Patrick's property. 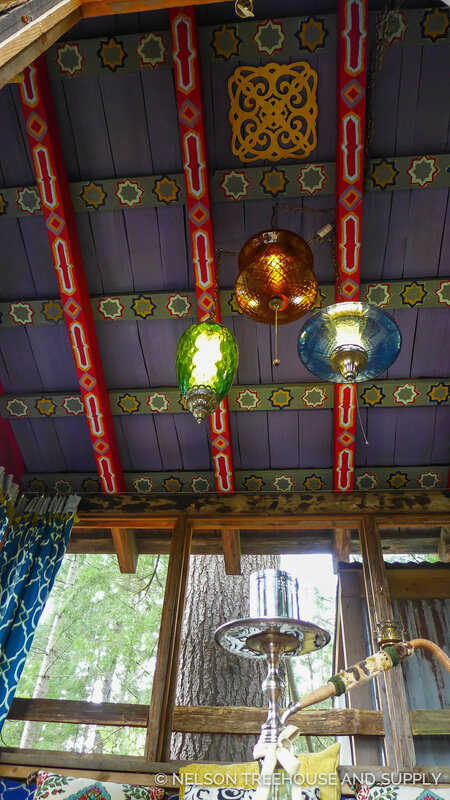 To left and above: The Bird Blind at TreeHouse Point, before its big move to Emily and Patrick's home. To update the Bird Blind in its new home, Pete and the crew added three ship's ladders leading up a series of viewing platforms to an expansive deck. 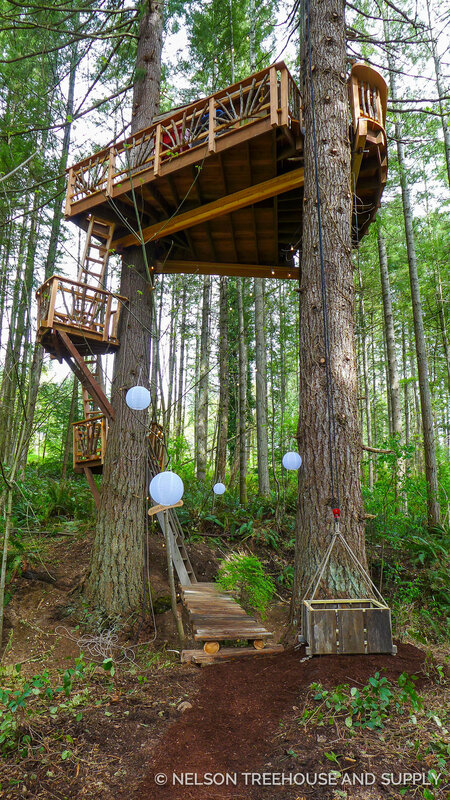 This enchanting, transplanted treehouse roosts 32 feet high in three towering Douglas fir trees. The Moorish-inspired interior, with its low seating area and ornately painted ceiling, is the perfect place to cozy up on wet winter nights. 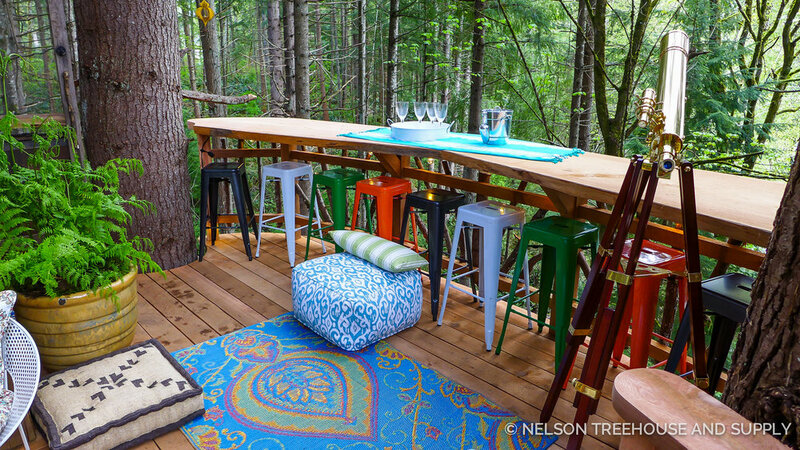 In the summer, you can’t beat the views from the screened-in sleeping area and ample deck. Handcrafted details add character, like the hand-cut cedar shakes and natural cedar branch deck railings arranged in a sunburst pattern. To top it all off, the crew build a handy “Bun-waiter” for hauling up supplies and the couple’s adorable pooch, ToastyBun. 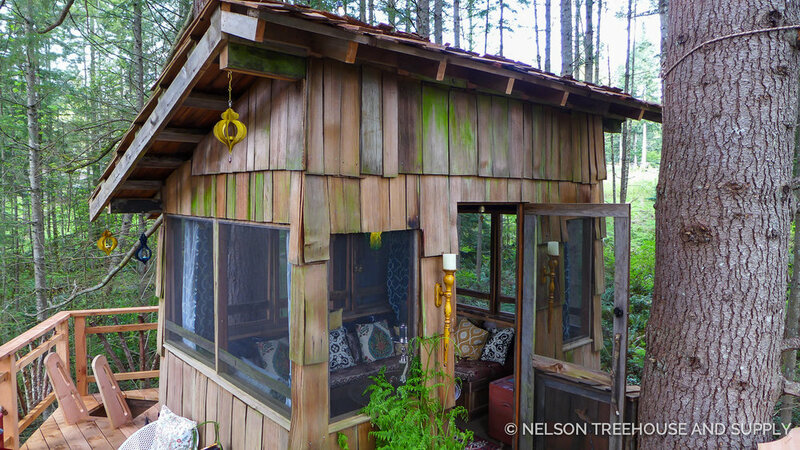 Scroll through Pete's photo slideshow below to tour this lovely Nelson family treehouse! We hope you've enjoyed reminiscing about this special build! To stay updated on all things treehouse, please follow us on social media and subscribe to our newsletter.